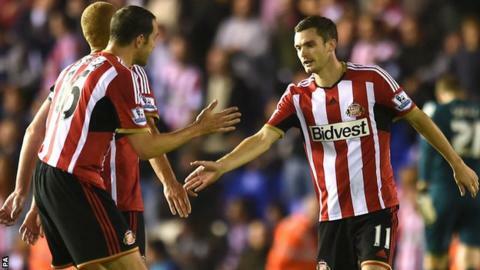 Sunderland scored three second-half goals to defeat Championship side Birmingham City and move into the third round of the Capital One Cup. David Cotterill hit the post and Wes Thomas fired an effort wide as Blues came close to taking a first-half lead. But their opponents took control late on as Jordi Gomez scored from 25 yards following Adam Johnson's square pass. Johnson doubled the lead after good work from Jozy Altidore, before Connor Wickham's angled effort sealed the win. Gus Poyet's team will now play fellow Premier League side Stoke City at home in the third round of the League Cup. Sunderland have never won the competition, but lost in the 2013-14 final, when they were beaten 3-1 by Manchester City at Wembley. "I'm not speaking about the officials, I'd rather spend my hard-earned money on something else rather than a fine. I am going to go through the right channels, I will have some footage for them. "It's not a true reflection of the game. We played well, the scoreline does not do my players justice. After the first goal the players started chasing the equaliser and Premier League players will pick you off. "We were more than a match for a very good team." "It was a strange game, it was a poor first half but somehow we got to half-time 0-0 but the second half was different. "The same group of players got something at half-time and the first goal was key. "It's not going to be perfect all the time, after we scored it was the best we have played this season. We played rubbish for 45 minutes but we finished the game on a high. It's the way the Cup goes." Match ends, Birmingham City 0, Sunderland 3. Second Half ends, Birmingham City 0, Sunderland 3. Foul by Adam Johnson (Sunderland). Goal! Birmingham City 0, Sunderland 3. Connor Wickham (Sunderland) right footed shot from the centre of the box to the bottom right corner. Assisted by Emanuele Giaccherini. Goal! Birmingham City 0, Sunderland 2. Adam Johnson (Sunderland) right footed shot from the centre of the box to the bottom left corner. Assisted by Jozy Altidore. Attempt missed. Clayton Donaldson (Birmingham City) right footed shot from the centre of the box is close, but misses to the left. Corner, Birmingham City. Conceded by Wes Brown. David Cotterill (Birmingham City) wins a free kick on the left wing. Attempt saved. Clayton Donaldson (Birmingham City) right footed shot from the centre of the box is saved in the bottom right corner. Goal! Birmingham City 0, Sunderland 1. Jordi Gómez (Sunderland) left footed shot from outside the box to the bottom right corner. Attempt blocked. Paul Caddis (Birmingham City) left footed shot from the right side of the box is blocked. Attempt missed. Stephen Gleeson (Birmingham City) right footed shot from outside the box is just a bit too high. Wes Brown (Sunderland) wins a free kick in the attacking half. Attempt saved. David Edgar (Birmingham City) right footed shot from outside the box is saved in the bottom left corner. Attempt missed. Wes Brown (Sunderland) header from the right side of the six yard box is close, but misses to the left following a corner. Corner, Sunderland. Conceded by Jonathan Spector. Attempt saved. Liam Bridcutt (Sunderland) right footed shot from outside the box is saved in the centre of the goal. Attempt blocked. Jordi Gómez (Sunderland) right footed shot from the right side of the box is blocked. Corner, Sunderland. Conceded by Stephen Gleeson. Attempt blocked. Jozy Altidore (Sunderland) right footed shot from outside the box is blocked. Attempt missed. Lee Novak (Birmingham City) right footed shot from outside the box is too high. Substitution, Birmingham City. Lee Novak replaces Mark Duffy. Liam Bridcutt (Sunderland) wins a free kick in the attacking half. Wes Thomas (Birmingham City) is shown the yellow card.